Amro spent 2.5 years as post-doc in Prof. Paunov research group working on anisotropic particles in 2006-2008. In 2015 he joined us again as a Visiting Professor to work on novel encapsulation systems. The main objective of the current project is to formulate novel drug delivery systems based on natural biopolymer microcapsules of different species and to investigate their microencapsulation and release efficiency. Sporopollenin, the biopolymer shell of pollen grains of higher plants, is a highly stable and versatile yet so far poorly characterized material that offers several advantages over man-made and other naturally occurring materials (e.g., acrylic resins and chitosan). Sporopollenin is easily extracted from its natural sources, spores or pollen, using inexpensive, non-toxic reagents that are used in the food industry. It forms microcapsules with a large internal cavity that is available for encapsulation with very high loading. The particles are monodisperse, and those from a single species are uniform in size, morphology and chemical composition. Sporopollenin contains only carbon, hydrogen and oxygen and is thus free from any allergens. Such uniformity is difficult and expensive to achieve in man-made products, especially in materials with a large cavity capable of encapsulating a wide range of polar and non-polar materials. We develop novel drug delivery systems and encapsulants based on the natural biomaterials like sporopollenin, which can encapsulate drug molecules through its surface nano-channels and nano-pores . 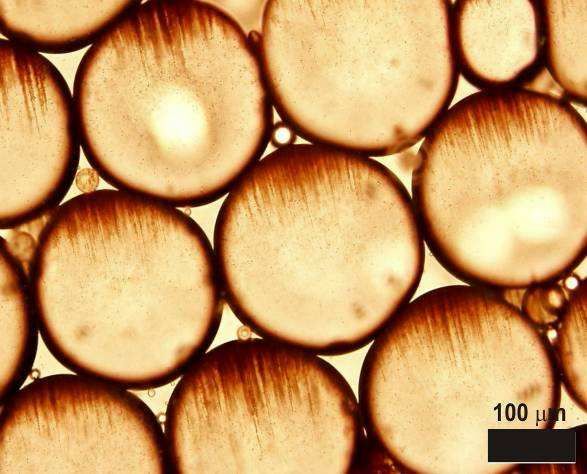 Microencapsulation is a technique widely used in the cosmetic, pharmaceutical, and food industries for oral or topical drug delivery, protection against light or air, controlled release or taste-masking. We explore the use of sporopollenin microcapsules as an alternative platform for the oral delivery of materials and drugs that are usually delivered by injection by protecting the active ingredient so that it can be delivered to the lower gut [2,3]. Oral delivery is based on the fact that certain plant pollens or other spores are capable of reaching the gut wall, largely intact, thereby releasing their contents. A major question associated with the use of sporopollenin for microencapsulation is related to the feasibility to encapsulate and eventually release and recover undamaged encapsulated materials that are relatively unstable to conditions such as denaturing or oxidation . Moreover, bioavailability and drug solubility are important issues regarding the efficiency of targeted drug delivery systems. Fig.1 TOP image: Scanning Electron Microscopy image of sporopollinen from Lycopodium Clavatum (running pine). BOTTOM image: Optical image of sporopollinen loaded with an organic complex (model drug). We have designed a novel technique for fabrication of magnetic Janus microparticles based on “trapping” the alignment of magnetite nanoparticles dispersed within the oil drops of polymerizable oil-in-water emulsion. We polymerized the oil drops after gelling the continuous aqueous phase in the presence of an external magnetic field (Fig. 1). This allowed us to produce magnetic Janus particles with optical and magnetic anisotropy which form unusual zigzag chains and structures when an external magnetic field is applied to a suspension of such particles. These novel microparticles retain high remanence magnetization and coercively values indicative of ferromagnetic behaviour, which indicates that the composite polymeric Janus microparticles possess a net magnetic dipole and behave like micro-magnets due to the “trapped” orientation of the magnetite nanoparticles in their polymeric matrix [1-2]. Fig. 1 Schematic representation of our method for the preparation of magnetic Janus microparticles from a polymerizable oil-in-water magnetic emulsion template. Fig. 2 TOP image: Optical micrographs of styrene oil drops containing 2 wt.% hydrophobised magnetite nanoparticles and stabilised by polymerisable surfactant Hitenol BC-10. BOTTOM image: The magnetic o/w emulsion under magnetic field but before polymerization. Note the cat-eye structure of the magnetite particle aggregates inside the drops which form in magnetic field. Fig. 3 Optical micrographs of an aqueous suspension of magnetically anisotropic polystyrene microparticles fabricated by polymerizing gelled magnetic styrene-in-water emulsions under magnetic field. The particles are later released from the melting the hydrogel and washing with water. We found that the emulsion drops exhibited chain structure where the magnetic parts of neighboring microparticles align together forming magnetic “lanes”. An optical image of the aqueous suspension of these particles is shown in Figs. 2 and 3. The produced microparticles exhibit shape, magnetic and optical anisotropies. They formed zigzag chains in an external magnetic field as their magnetic dipoles interact with each other.